$43M IN CASH FOUND IN EMPTY NIGERIAN APARTMENT WELL NOW IM - ProudMummy.com the Web's Community for Mums. $43M IN CASH FOUND IN EMPTY NIGERIAN APARTMENT WELL NOW I'M JUST KICKING MYSELF. 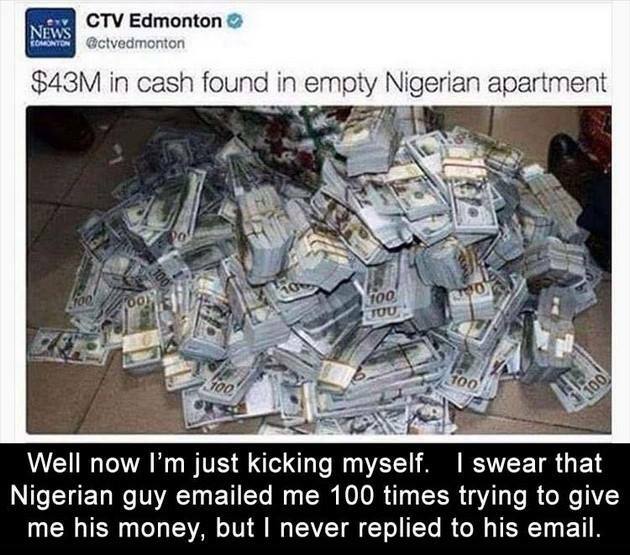 I SWEAR THAT NIGERIAN GUY EAILED ME 100 TIMES TRYING TO GIVE ME HIS MONEY, BUT I NEVER REPLIED TO HIS EMAIL.